Surveyors determine legal property boundaries. They provide data and compile legal documents called surveys for building, mapmaking, and real estate projects. A homeowner might hire a surveyor when there's a need to ascertain property lines. Government agencies also use surveying services when they're building roadways and other infrastructures. Those who work in this discipline are might be called land, site, or property surveyors. Approximately 44,800 people were employed as surveyors in the U.S. in 2016. Almost three out of four worked in the fields of engineering and architecture. The job duties that surveyors should expect to have can be diverse and require various training and skills. Surveyors working for the government earned a median salary of $70,340 annually in 2017. The overall median salary drops somewhat when other job sectors are factored in. This profession requires both education and accreditation. Education: You'll usually need a bachelor's degree to work as a surveyor. 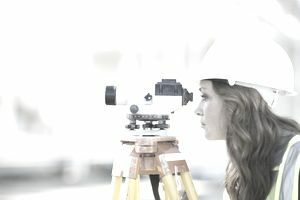 Most employers prefer job candidates who have majored in surveying, but some will hire workers who have degrees in civil engineering and forestry. Licensure: All states and the District of Columbia have specific requirements set by their professional licensing board. They can include a college degree from an ABET-accredited program, passing multiple exams, and getting several years of work experience. The National Council of Examiners for Engineering and Surveying (NCEES) maintains links to state licensing boards on its website. You'll need certain soft skills to have a successful career as a surveyor. Reading comprehension: You must be able to understand written documents. Mathematics: An aptitude for applying mathematical principles to solve problems is necessary. Detail oriented: Accuracy is of the utmost importance because you'll be preparing legal documents. You must also take great care when taking and recording measurements. Listening skills: You'll have to understand instructions from others, including architects and project managers. Speaking skills: You'll have to communicate information to members of your team and your clients. Time management skills: It will be necessary to plan your own and your team's time on each job. The U.S. Bureau of Labor Statistics expects 11 percent growth in this job between 2016 and 2026. Individuals who have bachelor's degrees will fare better in the job market. Engineering firms employ the majority of surveyors, but some work for construction companies and state or local governments. The job can involve a mix of office duties and field work, and field work can involve climbing and hiking, often carrying cumbersome equipment and in inclement weather. Surveyors can also potentially find themselves in harm's way when working construction sites and on major thoroughfares with heavy, passing traffic. This is predominantly a full-time occupation, and overtime can be expected during times when construction activity is at its peak or when a project involves fieldwork. Construction work can be somewhat seasonal in some areas of the country where there's a marked weather difference between summer and winter months. This profession doesn't always stick to a clock. Long commutes to job sites are common, and sometimes distances require that surveyors remain away from home, living nearby to the site, for weeks or months at a time. They might not be working 24/7, but their personal lives are nonetheless impacted. Those interested in surveying might find that their skill sets predispose them and qualify them for other careers as well.